One of the smallest countries in South America, tourist-friendly Uruguay is often called the "Switzerland of South America" because of its consistent economic development and progressive society. Open-minded Montevideo serves as the starting point of most Uruguay holidays, offering visitors an eclectic cultural scene and a chance to discover some of South America's major architectural treasures. Away from the cosmopolitan capital city, vacations in Uruguay involve exploring wildlife-rich areas along the Atlantic and touring the rustic interior on horseback, gaucho style. In this sports-loving country, the highlight of your Uruguay trip might just be a soccer match between Penarol and Nacional, the country's two major clubs. Montevideo Department: The country's most populated administrative unit is home to the capital city, as well as to one of the most important wetland habitats you'll find on your Uruguay vacation. Maldonado Department: Blending modern life with traditional customs, this southeastern department boasts some of the finest beaches in South America and a plethora of glamorous holiday resorts. Rocha Department: This summer oasis invites you to explore its sandy beaches and fishing villages, observe colonies of sea lions along the coast, and watch gauchos working on cattle ranches. Rivera Department: Located near the Brazilian border and encompassing areas of dense, lush rainforest, this northern region offers some duty-free shopping on your Uruguay holiday. 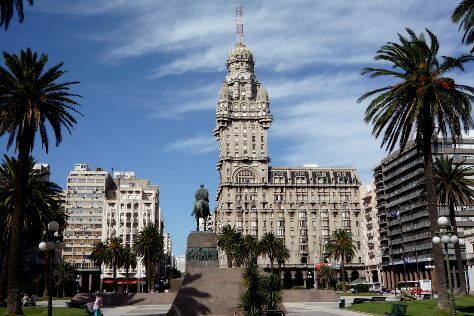 Montevideo: Proudly preserving its rich heritage, the capital remains one of the most entertaining places to visit in Uruguay with its a rich cultural scene and plenty of developed beaches. Colonia del Sacramento: This World Heritage-listed city offers a chance to admire well-preserved colonial architecture while enjoying all the amenities of a modern Uruguay vacation destination. Punta del Este: One of South America's most glamorous holiday resorts appeals to tourists with deep pockets and Uruguay's superstars--their loyalty to the town has earned it the the nickname "Monaco of South America." Piriapolis: Named after its founder, Francisco Piria, this coastal town ranks among Uruguay's premier beach resort destinations. Salto: A trip to one of Uruguay's largest urban centers offers a diverse Uruguay holiday experience filled with shopping and dining along attractive riverfront areas. Punta Ballena: Offering 12 km (7.5 mi) of beaches and an array of resorts, Punta Ballena allows visitors to choose from a selection of eco-tourism experiences, including hang gliding. Rambla de Montevideo: A stroll down the boardwalk along Montevideo's curving beachfront remains one of the most popular things to do in Uruguay. Museo - Taller de Casapueblo: Designed by the artist himself, the museum houses a collection of Paez Vilaro's exuberant works inspired by African candombe music. Barrio Historico: Coveted by both Portuguese and Spanish colonial forces because of its strategic location, this extremely important historical area boasts the ruins of a Portuguese fortress amid charming, crumbling houses. Los Dedos de Punta del Este: This beach sculpture resembling the grasping fingers of a buried giant or a hand of a zombie god is one of Punta del Este's iconic attractions. Ciudad Vieja: The bustling Uruguay attraction offers some of the best nightlife in the Uruguayan capital, as well as several museums and an excellent open-air market. Plaza Independencia: Acting as the nerve center of Montevideo, this vibrant square boasts a bronze statue of the national hero Jose Artigas atop his mausoleum. Puerto de Punta del Este: Serving as an international gateway to Uruguay, this buzzing marina offers views over the luxurious yachts and dining opportunities at a number of seafood restaurants. Pocitos: Montevideo's best-known beach neighborhood invites you to join in a beach volleyball or soccer game, watch boat races, or simply go for a swim. Mercado del Puerto: Located at the heart of Montevideo's docklands, this open-air market offers a heavenly array of fresh goods, from specialty meats to locally sourced fruit and vegetables. Colonia del Sacramento Lighthouse: Overlooking the Rio de la Plata estuary, this mid-19th century lighthouse remains in use, offering views over the harbor and the historic city. Meat, especially beef, remains the staple of Uruguayan diet due to the country's ample production of it. The most popular dishes include grilled cuts of all types, often prepared and served with intestines. Chivito, a Uruguayan version of a burger with sliced steak, can be found on the menu of every restaurant in one form or another. In terms of quick bites, pancho, the Uruguayan hot dog, and the traditional Uruguayan pizza por metro (literally "pizza by the meter") are ideal choices for tourists sightseeing in Uruguay. Because most Uruguayans live by Rio de la Plata or along the coast, fresh fish is another staple of Uruguayan cuisine. If you have a taste for seafood, visit some of the fishing villages by the Atlantic Ocean, like Cabo Polonio or Punta del Diablo. Even though meat is the main ingredient in almost every Uruguayan dish, vegetarians won't have as much trouble finding suitable alternatives as they might expect. Many restaurants and food stalls offer at least one vegetarian option, particularly in big centers like Montevideo and Punta del Este. In addition, open-air markets, such as Mercado del Puerto, offer an abundance of fresh fruit and vegetables. Shopping is definitely not the first thing that comes to mind when planning a Uruguay vacation, though the country offers good retail options in both major cities and smaller towns. Prices of goods vary greatly from shop to shop, so it pays to browse around to get the best deal. It is also useful to carry cash instead of cards--sellers are often more inclined to negotiate the price if you are prepared to pay cash, especially if you offer American dollars. Popular places showcasing and selling handmade products by local artisans and artists include Acatras del Mercado - Galeria de Arte and Mercado De Los Artesanos. Offering clothing, jewelry, woodwork, textiles, sculptures, paintings, and other original pieces, these markets represent a good option for souvenir and gift shopping. One of Montevideo's best malls, Punta Carretas Shopping boasts a range of shops specializing in goods like leather products and children's toys. If you need to pick up some last-minute bargains before you cross the Brazilian border, you can drop by Sineriz Shopping. * When translated from the Guarani language, the country's name means "River of Painted Birds"
Avoid criticizing the locals for enjoying meat, namely beef, in extreme quantities; if you don't eat meat yourself, turn it down with respect. Many locals root for one of two soccer clubs--avoid offending your friends or acquaintances by refraining from commenting negatively about either team. While most Uruguayans are political and don't mind discussing political issues publicly, foreign visitors should refrain from expressing their opinions about sensitive issues--unless you're thoroughly familiar with a topic, it's probably best to keep your opinions private during your tour of Uruguay. There is a festive event or holiday in Uruguay nearly every month, with the exception of September and April. Uruguayans celebrate Christmas, New Year's Eve, and Labor Day (May 1) like most of the Western world. They also observe other public holidays less familiar to foreign visitors on vacation in Uruguay. Examples include July 18 (Constitution Day), August 25 (National Independence Day), and October 12 (Dia de la Raza, similar to Columbus Day), when public institutions and most businesses close. The Carnival season starts on February 20 and is marked by singing, dancing, drumming, and other kinds of festive behavior taking place in the streets, including pop-up theatres staging mini-operas on social topics. Another time of the year suitable for experiencing the local culture is autumn--on November 2 (All Saints' Day), for example, you can parade with the locals carrying mock coffins and paper-mache skulls. If you don't have time to learn some basic Spanish before you take a trip to Uruguay, consider carrying a Spanish pocket dictionary or phrasebook. Upon meeting someone for the first time, you'll usually be greeted warmly with a firm handshake. However, the next time you meet you might get a kiss on the right cheek, which is a typical Uruguayan greeting among acquaintances. You will also find that Uruguayans stand close to each other (maybe a bit too close for North American standards) when conversing, occasionally touching the other person's shoulder or arm. These gestures are in sync with the Uruguayans' warm personalities and don't have a deeper or hidden meaning--nor are they meant to offend or make you feel uncomfortable. As the only South American country outside the tropics, Uruguay enjoys a moderate climate all year round. The biggest disadvantages of Uruguay's position are chilly winds and sudden weather changes due to the lack of geographical weather barriers, namely mountains. The Pampero, an icy and occasionally violent burst of cold polar air blowing from the Argentine pampas, can rapidly break a winter warm spell. Both summers and winters are relatively mild. Summer temperatures vary between 18 C and 28 C (64 F and 83 F), while winter temperatures occasionally drop below -5 C (23 F). Keep in mind that summer in Uruguay lasts between December and February, while July-September are the coldest months of the year. Due to the proximity of the Atlantic Ocean, humidity is Uruguay is generally high and fog is common, especially in spring and during the winter months. As the rainiest month of the year, October remains arguably the least favorable time for a trip to Uruguay--especially for visitors interested in outdoor activities and tours. Beach resorts are packed between Christmas and February, and the peak of the tourist season is in January--if you plan to vacation in Uruguay during that time, consider reserving your accommodations and activities in advance. Due to the relative flatness of the country's terrain, distances within Uruguay are easy to cross. Probably the best way to personalize your Uruguay holiday experience is by renting a car, scooter, or bike--any of these modes will allow you to create your own itinerary (avoiding busy traffic on major roads, perhaps). You'll also be able to explore the countryside at a more leisurely rate if you have access to your own transportation. From Montevideo and neighboring communities public buses can take you almost anywhere in the country. Buses are more reliable than trains when it comes to time schedules--something to consider if you're planning to work through a busy itinerary. If you wish to spend time exploring the scenic banks of the River Uruguay between Salto and Colonia del Sacramento, consider taking a boat trip. Whether dining or just having a drink at a restaurant or bar, customers generally add a 10 percent tip to the bill (unless this service is already included in the total). Bellhops usually receive 20 pesos per bag, while parking valets appreciate a tip of 5-10 pesos for watching your car while you shop or eat. When it comes to taxi drivers, rounding up the fair is generally sufficient.